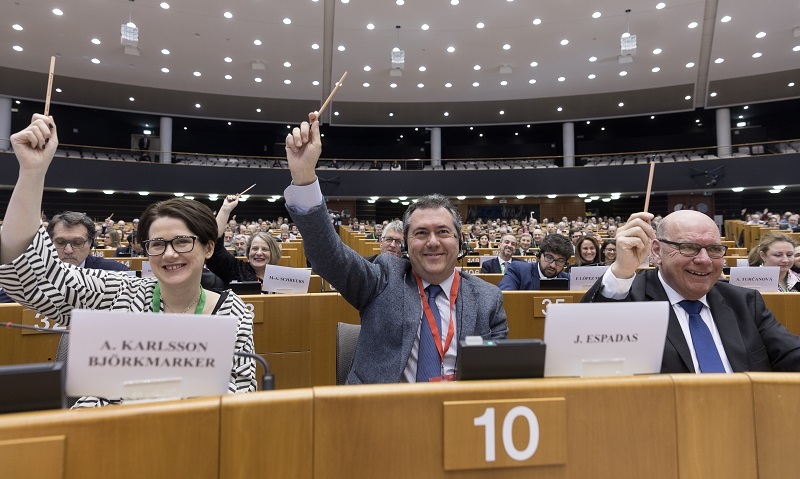 On Thursday 22 February, the European Covenant of Mayors celebrated its 10th anniversary in the hemicycle of the European Parliament in Brussels. Local and regional leaders from 700 cities and regions present pledged to support the 2030 objectives of the initiative, and increase their use of innovative and climate-friendly technological solutions to tackle the challenges of climate change and the energy transition. The 2018 ceremony of the initiative had a twofold purpose: to take stock of the results achieved by the more than 9,000 local authorities committed to the European Covenant, and to look towards the next steps for the world's pioneering local energy and climate movement. European high-level representatives such as EU Commission Vice-President Maroš Šefčovič, the Commissioners Miguel Arias Cañete and Carlos Moedas and the Bulgarian deputy minister for energy and representative of the EU Bulgaria Council presidency, Zhecho Stankov, congratulated the European Covenant cities on their actions delivered so far, which will contribute over 1/3 to the EU's GHG emission reduction target of 20% by 2020. Furthermore, these cities will on average cut their emissions by 27% by 2020, reduce their energy consumption by 20% and increase their local energy production by a staggering 90%. "Cities are playing a decisive role in the clean energy transition", said Dominique Ristori, Director-General for Energy in the EU Commission, in his opening address. Some of the key themes of the 10-year ceremony were the need for increased dialogue and local involvement in climate and energy action. 2018 is the year of the so-called 'Talanoa Dialogue', an international dialogue to help take stock of the collective progress towards the long-term goals of the Paris Agreement, building up to the next UN climate conference in the Polish city of Katowice in December, the COP24. The Talanoa Dialogue is considered to be an important opportunity for local and regional authorities, to tell the international community where they are, where they want to go and to discuss how to get there. Jos Delbeke, Director-General for Climate Action in the EU Commission, and Ovais Sarmad, Deputy Executive Secretary of the UNFCCC, both called on European Covenant cities to engage in this process and collectively contribute to scaling up European and international climate ambition, as they have a key role in the delivery of the objectives of the Paris Agreement. In order to bring the voices of European Covenant signatories to the international climate stage, Commissioner Arias Cañete announced a new initiative to select a group of mayors that will become European Covenant envoys at the COP24 conference in Katowice - stay tuned in the coming weeks for more information on this! Dialogue and involvement were also key in the interventions of the members of the European Covenant board, which presented their vision for the future of the initiative. The mayors of Heidelberg, Sevilla and Ghent, the deputy-mayor of Växjö and the director of REGEA (North-West Croatia Energy Agency) called for a strong multi-level partnership on an equal footing between cities, regions, the national level and EU institutions. The President of the European Parliament, Antonio Tajani, and the president of the European Committee of Regions, Karl-Heinz Lambertz, both stressed the need for a strong involvement of cities in the future EU budget, in order to ensure that increased local climate and energy ambition is backed up by sufficient means available. It became clear in this ceremony that cities need allies - not only in their own constituencies and in all governance levels, but also in the private sector. While cities are "the beacon of innovation" , as Commissioner Moedas said in his intervention, they don't have all tools at their disposal alone to accelerate their climate and energy action. That is why Commission Vice-President Šefčovič encouraged European Covenant cities to join forces with industry to speed up the energy transition, inviting mayors to "be bold" and invite entrepreneurs to their cities in order to try new solutions. Commissioner Moedas recalled that cities are not afraid of experimenting, and that European Covenant cities such as Paris, Amsterdam and Barcelona have already achieved remarkable innovations. At the ceremony, Moedas launched the 2018 European Capital of Innovation award. This EUR 1 million prize will reward cities who have built the most dynamic innovation ecosystems. Bertrand Piccard, initiator and chairman of the Solar Impulse Foundation and the inspiring visionary behind the solar airplane that flew around th e world, stressed the potential of innovative, clean technologies to create sustainable growth and a healthy environment in cities. Piccard invited European Covenant cities to cooperate with innovators under the World Alliance for Efficient Solutions, which aims to bring by the end of 2018 the 1000 most profitable, clean and effective solutions to cities and the market. During the ceremony, a side-event was held in the Committee of the Regions to match local leaders from European Covenant cities with dozens of innovative entrepreneurs from Solar Impulse's World Alliance. The other side-events held in the framework of this year's ceremony focused on linking Smart Cities and the European Covenant, making investment in climate adaptation profitable and strengthening the cooperation between the Covenant ambassadors of the Committee of the Regions and the European Covenant of Mayors board.